Through 10-15 December 2018, the Colombian Geothermal Association (Asociación Geotérmica Colombiana, AGEOCOL), conducted the third annual meeting called Geothermal National Meeting (Reunión Nacional de Geotermia, RENAG) in Bogotá, Colombia. RENAG 18 was composed of three main activities: pre-congress workshops (10-11 December), presentation of papers (12-14 December) and a post-congress field trip on 15 December. These activities gathered around 100 people along the week, most of them young students and recent-graduate professionals in Earth Sciences, Engineering and some social sciences. 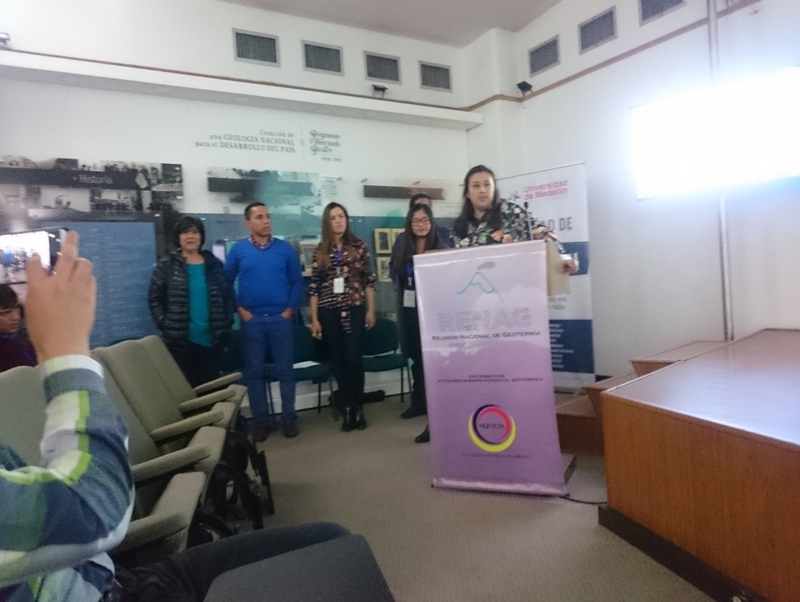 The event was co-hosted by the Colombian Geological Service (Servicio Geológico Colombiano, SGC), with the purpose of strengthening the geothermal knowledge in the country. Two short courses were conducted the first two days (10-11 December), one on fluid inclusions and the other on geochemistry of diffuse gases, both instructed by experts from the governmental company in charge of the geothermal fields in El Salvador, LaGeo –which was also a main supporter of RENAG 18. Approximately 20 persons attended the courses held in the SGC. One special workshop on the geothermal roadmap for Colombia was developed on 11 December, in the conference room of the National Hydrocarbon Agency (Agencia Nacional de Hidrocarburos, ANH). It was conducted by Pablo Aguilera Bustos, the current President of AGEOCOL, and Luis C.A. Gutiérrez Negrín, from Mexico, whose participation was financed by the IGA through its Education Committee. Pablo Aguilera presented a general introduction and the expectations that the association had on the workshop, as well as the status of the current regulatory framework in Colombia. Luis Gutiérrez Negrín presented the main features of the two recent geothermal roadmaps for Mexico (one general and other specific for geothermal direct uses) and the process of their preparation, which was commissioned by the Mexican Ministry of Energy. He also presented the main components of the regulation related to geothermal energy in Mexico, particularly the Geothermal Energy Law, as well as the history and current status of the geothermal-electric development in the country and the main perspectives. The workshop also included two presentations from New Zealand, one pre-recorded by Bart van Campen about the regulatory framework in this country and its comparative to a couple of other countries (Chile and Iceland), and the other was an online presentation, through a teleconference about the GeoHeat Strategy that has been developing in New Zealand. The latter was presented by Andy Blair, President of Women in Geothermal (WING), and one of the founders and responsible of this initiative related to direct uses, outreach and inter-relations with communities. The final part of the workshop was an open discussion among all the participants, conducted by Pablo Aguilera and Luis Gutiérrez-Negrín. Some of the main outcomes and conclusions of the workshop can be summarized as follows: i) It is necessary to define the national geothermal potential in Colombia, based on the different studies and assessments performed up to now, activity that is part of the institutional responsibilities of the SGC. ii) The definition of an official geothermal roadmap corresponds to the Colombian government. It is recommendable that AGEOCOL continues its efforts to prepare a document defining the hurdles and challenges for the geothermal development in Colombia, which can be an important contribution to a further roadmap. 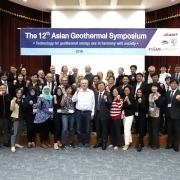 iii) It’s important to take advantage of any opportunity to propose to the proper governmental authorities recommendations for the formulation of a geothermal roadmap, for which AGEOCOL can count with the collaboration and support of participants from the SGC, UPME (the planning department of the Ministry of Mines and Energy) and other governmental offices. In the following three days (12-14 December) around 30 papers were orally presented in the main conferences room of the SGC. These presentations were grouped into four themes: i) Geothermal as base-energy at the national electric market. ii) Human talent. iii) Science and Technology. iv) Communities. Every theme had a panel discussion with all the speakers and the floor open for questions, answers, comments and proposals by the audience. The audience was encouraged to participate by moderators of each theme, producing wide and vivid discussions. The field trip to the geothermal zone of Paipa, was conducted by Jesús Rueda, geologist from the SGC and active member of the AGEOCOL on 15 December. Before the closure of the main event, on the evening of 14 December, the President of AGEOCOL read the Bogotá Declaration, an official statement of the association prepared with the recommendations gathered during the event and the results from the discussion panels, on the current status and possibilities of geothermal in Colombia. After that, participants were invited to join a closure reception hosted by LaGeo in the same SGC facilities. Establish an action group to work continuously and together in coordinated workshops towards completing the strategic actions. Quantify the geothermal resource and the capacity potential. Offer ongoing training for local people. Socialize geothermal in communities, schools, and universities from the social and academic perspectives. Give recommendations to strengthen the geothermal regulation. Find ways to participate in high levels of politics. The current Board of Directors of AGEOCOL will work in the involvement of AGEOCOL members and the participants of RENAG 18 with these actions, for the promotion of geothermal energy in Colombia. AGEOCOL also ran its first general assembly during RENAG 18. It was held at the evening of 12 December, and was open for all members of the association to attend. Ten active-members of the association, with right to speak or vote as established in its bylaws, were present. Among them, three of the Board members were physically present (the President Pablo Aguilera, the Vice-President Valeria García, and the Treasurer Carolina Coronado), and one participated remotely (the Secretary, Ángela Prieto). The Assembly was conducted by the President, and the agenda was composed of the reports by the President and the Treasurer and other business, among which was the decision to hold RENAG 19 on 25-29 November 2019 in Medellín, the second largest city in Colombia.